April 13, 2018: Recent ocotillo mortality from drought stress and flathead borer, Glen Springs Road, Big Bend National Park. Mortality is anywhere from triple to 10x normal and includes pines, fir, juniper, shrubby species, creosote, lechugilla and succulents. We all want a healthy climate and assume that emissions reductions will give us this healthy climate, but emissions reductions alone allow triple to quintuple the warming we have already seen. Today, the public and policy makers –almost completely– believe emissions reductions strategies can create a sustainable and healthy climate. But because of delay, emissions reductions policy alone produces an unlivable and unsustainable climate. Even with complete implementation of Paris Climate Commitments, of 80 percent emissions reductions by 2050, and 100 percent reductions (net zero) by 2080, our climate will continue to warm triple (2.1 C by 2050) and quintuple (3.5 C by 2100) what we have already warmed. The vast majority of citizens and our leaders — do not know this. The vast majority of citizens and our leaders trust emission reductions to be sufficiently sustainable. But they are not. Today, with only about 1 C of warming, U.S. climate catastrophes in 2017 were $140 billion more than the previous record set in 2005 ($400 billion in 2017 vs. $260 billion in 2005.) Even with complete implementation of Paris Climate Commitments, we continue to warm; warming is not reversed. With more warming, obviously there will be more impacts. The climate science says these impacts will increase nonlinearly. That is, a little more warming will create a lot more impacts. This is why outreach for a healthy climate is so valuable. To create a sustainable healthy climate, whether it is through direct air capture, biologic climate pollution reduction strategies, or even temporarily refreezing the Arctic while we scale other strategies to deal with climate pollution, we must first produce the public and policy will to go beyond emissions reductions alone. The most important part of climate restoration outreach then, is to communicate the fact that emissions reductions strategies alone do not create a sustainable healthy climate because — the delay has just been too long. Once it is commonly understood that emissions reductions alone do not achieve what “legacy” climate reform strategies have been assumed to create for 30 years, we can get along with removing some of the accumulated climate pollution that is causing all the trouble to start with. Over the last 30 years or thereabouts, since we first developed the concept of dealing with climate pollution to create what we all believed was a “healthy climate,” we have emitted as much climate pollution as we emitted in the last 200 years. To fix our climate now — to create a healthy climate and prevent the vastly disrupting climate impacts that are already occurring — we have to deal with this climate pollution that we have already emitted. Once this vast load of pollution is removed from our atmosphere (through whatever means,) then we have an opportunity to create a truly sustainable planet. Without dealing with the vast load of pollution already resident in our sky, sustainability is just a dream. 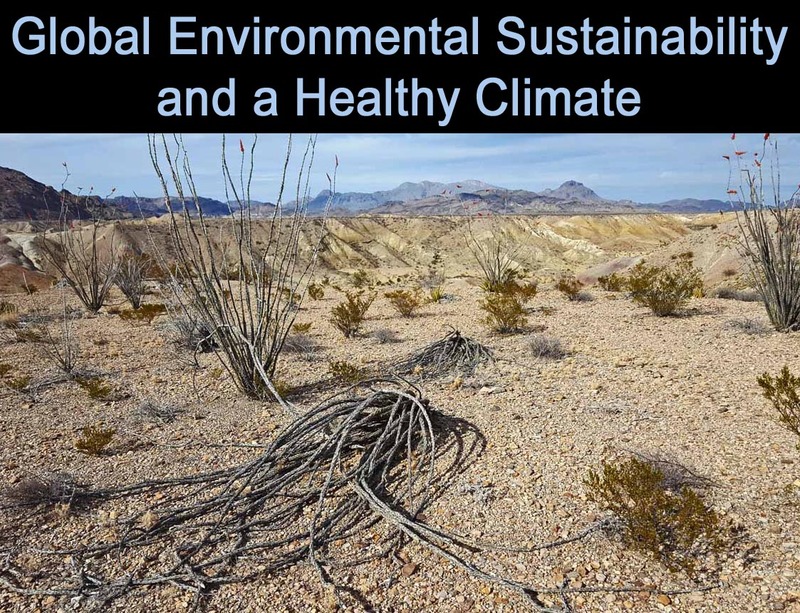 At a presentation I did just last Saturday in far west Texas at Sul Ross University (and again at UT Dallas on Monday), I realized a comparison about accumulated environmental pollution that really hit home. It comes from Richard Alley’s book Two Mile Time Machine (Penn State ice scientist; a book about Greenland ice cores.) In the 19th century, we discovered that germs were killing millions of people because of disease spread by the ubiquitous practice of dumping night water (human sewage) into the ditch behind the house. To deal with this pollution, first we disposed of the “night water” in a hole in the ground via an outhouse. Then, when the sewage found its way into our shallow wells or lake and river water supply sources, we built toilet and pipe technologies to carry the sewage to the river downstream of our communities. Then, as our rivers became more and more polluted, we realized we needed to first treat the human sewage before we dumped it. It took over a hundred years to implement technology to collect, transport, and finally treat human sewage pollution so that we could create a sustainable planet. Imagine now — when we were going through this process our global population was only about a billion people: How many of us would be alive today if we had of continued on with little or no technology to treat night water? This is exactly what we are doing to our planet today. We have been emitting night water and it has accumulated in our sky. Reducing emissions, replacing fossil fuels, and transitioning our society to less damaging energy sources is crucial, but today we must also deal with the pollution that is already there because if we don’t, even with the best-case scenario of emissions reductions, we continue to drown in our own night water. There are sustainable ways to treat pollution. It’s only through widespread communications that we can defeat the propaganda of the Climate Change Counter Movement and bring the latest science into the discussion. Tell your friends. And, check out the Healthy Climate Alliance everyone. It’s a new way to think about what we thought we have been thinking about all along. We will transform our society’s energy infrastructure, but unless we do something about the load in the sky, it’s all for naught.